My cat Schitzy is much like the fictional feline named Garfield and who is gifted with a natural instinct to sense and hunt down Italian food. We find that when we make this bacon lasagne at home he will sit in front of the glass window in the oven door and stare till finally the buzzer dings. Now that Schitzy has gotten older his poor little tummy can't handle the tomato sauce, but it doesn't stop him from trying to snag a bite off my plate of lasagne when I'm not looking. 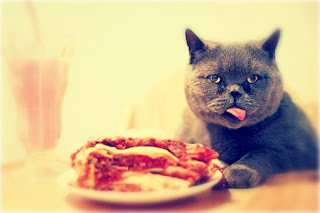 There's a special place for Schitzy someday, in lasagne heaven. The Best Malt Vinegar? A Taste Test! A while back I imported some brewed malt vinegar from Britain for Shannon's Christmas gift, the real deal: Sarson's. She had recently fell in love with a Heinz version here in the United States (after trying it at a local fish restaurant), and our local grocer carries a "London Pub" version, which we bought after flying back from London and had been sitting in the fridge. That's when we came up with the idea for a taste test to determine the best malt vinegar. 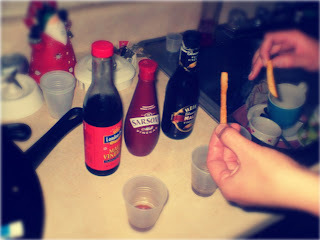 Today we went and got some fries (ahem chips) to try out the new fancy-British malt vinegar and compare it against the U.S. versions. So I took three plastic cups and wrote on the bottom 1, 2, & 3. The numbers correspond to the secret identities of the vinegars provided at random to Shannon, to test blindly. Unsurprisingly the authentic malt vinegar, Sarson's, came in at #1, and the Heinz #2, and while I couldn't do the test, I agreed with the results. Mustard is better than Ketchup? Your Condiment Allegiance. It's a question for all time: if America was to out-law either ketchup or mustard tomorrow, what condiment would you vote to keep (according to research, mayo is no. 1 in the U.S.)? 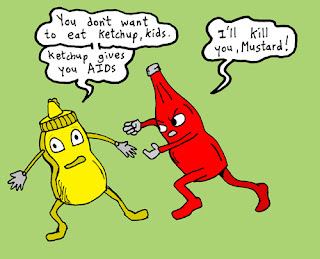 What's better, mustard or Ketchup? I'm clearly a mustard girl in this saucy showdown. I find the idea of ketchup on hot-dogs deeply evil. Unfortunately, I live with a ketchup whoreaficionado. Shan would sell my body to get a bottle of ketchup before she'd eat her food plain. She smothers it on everything, and it's rather gross. Of course the question arises, what would Liv do with French fries in the absence of ketchup? That's easy: Ranch or Fritesaus or Vinegar.